You may have heard a lot recently about electric vehicles (EVs). Sales of EVs are up, manufacturers are beginning to offer a variety of EV models – from sportscars to sedans – and our recent analysis found that 42 percent of American households with a vehicle could use an EV. So, why are car buyers getting more enthused about EVs? Since I’m not an EV owner myself (I continue to rely on my 25 year old Panasonic “collectors” bicycle – and by “collectors” I mean rusting hunk of Japanese steel), I asked UCS members who drive EVs what they like about driving on electricity. Read on to hear their stories and find out the top 7 reasons to consider an EV. Like saving money? Of course you do. EVs are dramatically cheaper to fuel than their gasoline counterparts. 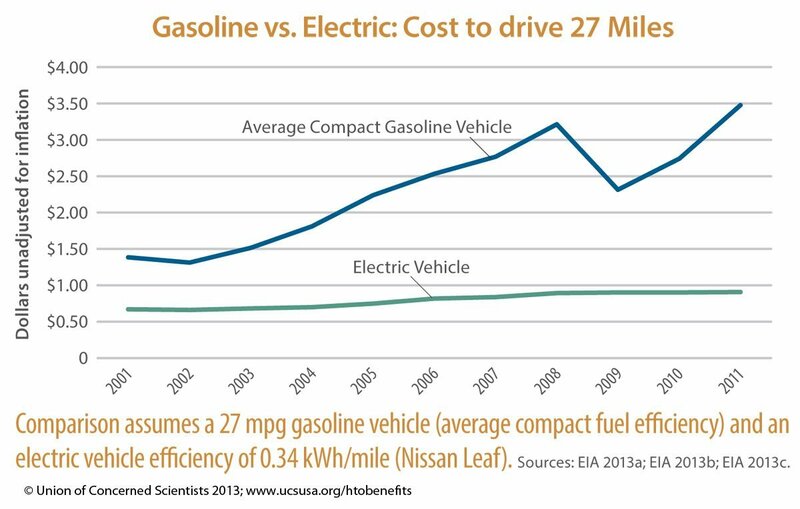 UCS analysis has shown that driving 100 miles on electricity costs an average of $3.45 compared to driving the same distance on gasoline, which would set you back $13.52. Over the average lifetime of a vehicle, these fuel savings swell to nearly $13,000 for EV owners. The average national price of electricity has remained fairly static over the last decade, whereas the global oil market has caused the average price of gasoline to rise, drop, spike, dip, and rise again over the same time period. Driving on electricity can help safeguard you from future spikes in the average price of gasoline and help families plan for how much money will be spent on fuel in the future. Note that the graph below is pulled from our Half the Oil Benefits report, which can be accessed here. Despite being an advanced technology, EVs are remarkably simple to maintain. EV engines have fewer moving parts compared to their conventional vehicle counterparts, and you can forget about oil changes in battery electric vehicles. Brake pads will also require periodic maintenance, but not nearly as often as conventional vehicles since EVs use brakes less thanks to regenerative braking. Though quantifying maintenance costs is difficult since newer EVs have not been on the roads as long as conventional vehicles, this particular study found that EV maintenance can cost 35 percent less than a conventional vehicle. EVs are straight up zippy. An electric engine generates instant torque (or turning force) whereas an internal combustion motor has a curve of torque that increases in tandem with engine revolutions per minute (rpm). This means that EVs get off the line quicker than my Uncle Chuck’s ‘96 Chevy Camaro. Check out the world’s fastest accelerating street legal EV zap the doors off muscle cars and imports in this video below. When running on electricity, EVs produce zero tailpipe emissions. Of course, there are emissions associated with the electricity that is used to charge an EV, and these “upstream” emissions are an important part of the equation when comparing the overall emissions, or “well-to-wheels,” calculation of EVs. UCS analysis has found that no matter where you plug an EV in, even if it’s in a region dominated by relatively dirty power – like coal – the emissions produced by an EV are less than the emissions of an average compact conventional vehicle. And, as America’s electricity grids become cleaner and fueled by more renewable energy – like solar and wind power – charging EVs will become even cleaner. Though the cost of many EVs is still at a relative premium, the price of new EVs has begun to come down. The Nissan LEAF experienced a large price cut in 2013, going from $35,200 to $28,800 before shipping and tax credits, and Chevrolet just announced that the 2014 Volt will get a $5,000 price cut compared to previous models. Moreover, car shoppers can still take advantage of the $7,500 federal EV tax credit and even more state-level tax credits or rebates. Illinois residents, for example, can receive up to an additional $4,000 off a qualifying EV, and Massachusetts Governor Deval Patrick just announced a new EV rebate program of up to $2,500 per vehicle. We all know the problems our oil uses causes, and that is why EVs are an essential part of our plan to cut the nation’s oil use in half in twenty years. EVs can save us nearly 1.5 million barrels of oil per day in 2035, and are going to continue rolling out as more drivers become comfortable with driving on electricity. Check out more about electric vehicles on our website, and find out how you can become part of a Half the Oil future. In some states like Georgia, if you negotiate well, EV cars are cheaper than ICE cars. Know some people who has gotten new Leaf SL for16k and an iMiev SEfor $8k. How could you go wrong at those below entry level prices? The stampeded has already started for Nissan Leaf leases that actually pay you back for each mile driven. have 2,500 miles on Volt @ 152mpge. charge at 110v at home and work (25 mile RT). made a mistake though. should have got a Tesla. do 200 mile trips occasionally and 1,150mile trips (DC-Fla 5x in 2013) next ev will be tesla. stopped going to gas stations about 3 months ago. don’t miss it. love the EV acceleration. I have put almost 9000 miles on my 2013 Nissan Leaf in the first year of my lease. One benefit that is not always mentioned but became immediately obvious this winter is the precise control you have over the low-end torque. It was definitely easier to drive over snow and ice without spinning my wheels. Cool blog. The guys in the shop are really impressed with electric cars at the drag strip. It’s neat how even the most practical electric car becomes a hot sports car at a touch of the accelerator.